Chicago Maroon: Did you play any other sports in high school? If so, how did you decide to focus on running? Francesca Tomasi: I did ballet throughout my childhood and through most of high school, so I didn’t dabble too much in school sports. But I did play some tennis and it was fun, but the spirit and passion in the track and field community at my high school far surpassed that of any other sport. I excelled in that environment. CM: What do you think about in the seconds it takes you to sprint? 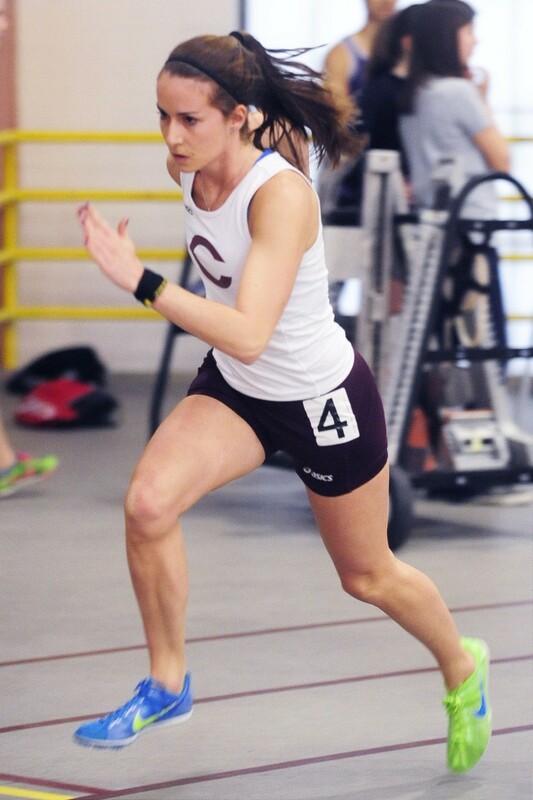 FT: My main race is the 400 and the race goes like this: You start off the blocks with a forceful push, accelerating on the first curve and maintaining strong momentum through the rest of the first lap (it’s two laps on an indoor track). Then you hang on for dear life and do your absolute best to finish strong and in front. Basically, go out hard; finish harder. So during this minute-long ordeal I usually think about anything other than the race I’m running—things that make me happy, because if you’re thinking about how you feel during a 400 you’re going to be miserable. Though when I start to hit a wall of exhaustion, I do think about maintaining good running form and mechanics in order not to slow down. CM: Do you watch professional track and field, either during the Olympics and/or other competitions? Outside of the professional track and field world, I found out a few years ago from my grandpa that his uncle, after fighting in World War I, was searching for something to do and joined a track club over in the Italian Alps. He ran 400 meters in exactly 50 seconds without having trained for it, and then proceeded to train for years, slowly shaving a couple more seconds off his time. I never met him, but knowing that I am related to someone who faced and conquered the same athletic challenge as myself (though replace 50 seconds in a 400 with 60 seconds) is pretty inspiring and motivating. CM: Any advice to casual runners for taking the next step and becoming competitive in the sport? FT: Don’t be afraid to push yourself. A lot of people who try to take the next step into competitive running get demoralized when they try a hard workout and either aren’t able to finish it the way they wanted to or feel like absolute crap at the end. It happens, but it shouldn’t slow you down. Obviously don’t try to kill yourself out there, but in [assistant coach Laurie McElroy’s] words, “You have to run fast to run fast.” Sounds obvious, but it’s true: If you always stay inside your comfort zone, that’s perfectly fine for a casual runner. But if you want to take the next step, you have to literally take that next step. It’s important to understand that there is a significant mental part to it. Keeping this in mind, though, my other piece of advice is to have fun. Running for the sake of running is so much more emotionally (and physically) rewarding than running purely for the sake of competition. It’s just like any other sport: If you’re passionate and positive about it, you’ll do well. You don’t have to be Usain Bolt caliber to succeed.